Domestic Water Heat Pump for an Existing Hot Water Tank. Heat pump for domestic water for an existing hot water tank. Available in two versions: smaller 1.8 kW, appropriate for connecting a 300 liter hot water tank and a bigger 2.5 kW, appropriate for connecting a hot water tank of 400 to 800 liters of water volume. Do you already own a hot water tank? Orca Wave Composite will help you heat water economically. Simply install it next to your existing hot water tank and save money. Orca Wave Composite is ideal for people who already own a new or a high quality hot water tank. 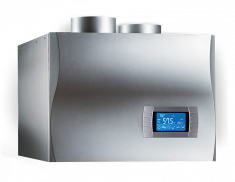 In such cases you can simply install Orca Wave Composite beside your existing hot water tank, which transforms instantly into an economic heat pump and utilises all the advantages of Orca heat pumps. A high airflow (500 m3/h) and a large evaporator result in a high C.O.P. High-quality rotary compressor from Hitachi.